Mike Rockenfeller was known to be racing the #23 Alex Job Racing #23 Porsche this year, in the ALMS: now it’s confirmed that Klaus Graf will be his full season partner, with Graham Rahal joining in at Sebring. 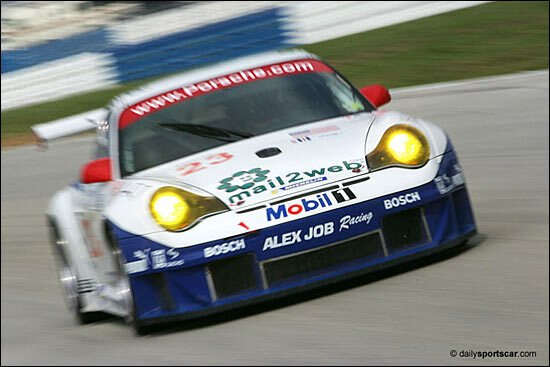 The Florida based ‘factory Porsche team’ will run just one car this year. Mike Rockenfeller needs no introduction here – or at AJR: he was outstanding in the team’s Crawford Porsche in the Rolex 24, and was a key part of the AJR / BAM! victory at Le Mans, in GT2, last June. It’s a welcome back to the ALMS to Klaus Graf, who raced a Panoz LMP1 in 2001, but faded from the American scene after that – although he was crowned the Trans-Am champion last year, with five poles and four wins, behind the wheel of the Rocketsports Jaguar. Graham Rahal comes to Sebring from A1GP, where he is driving the final three races for A1 Team Lebanon (he has Lebanese ancestry), while his 2006 will focus on the Champ Car Formula Atlantic series. He raced a Porsche for Tafel Racing in the recent Rolex 24 – so he’s probably fairly familiar with Mike Rockenfeller’s style of driving. “We have always done really well at Sebring,” comments Alex Job. “Last year we stumbled a bit, but we have studied our difficult 2005 race and we are more prepared than ever to add to our six victories here. We are pleased to have Mike Rockenfeller, Klaus Graf and young Graham Rahal with us for Sebring.